The Samwer brothers’ incubator Rocket Internet is heading back to the discount business with CupoNation, a coupon website launched this week in India and also active in Europe, South America and other emerging markets. 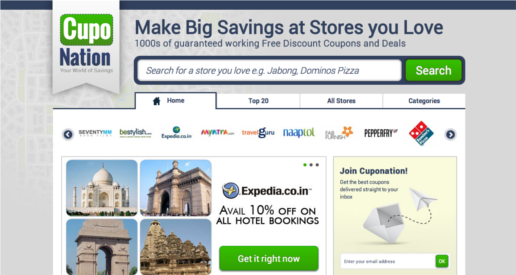 The new site aims to become India’s “largest coupon portal for online shoppers” and offers a range of discount coupons, deals, and vouchers codes for partner websites. The company will be led in India by Chirag Rakshit, an ex-manager at FabFurnish. CuponNation is plagiarizing from CouponDunia in a very signifcant [sic] way all throughout the site. It’s pretty standard practice among coupon sites to source codes from competitor sites. What isn’t standard is to copy and paste the exact coupon code descriptions that your competitors are using into your site. Rocket Internet isn’t mentioned in CupoNation India’s press release but a quick domain name register search reveals the link. FabFurnish and Jabong are among the first companies advertised on CupoNation India, while GlossyBox, eDarling and Westwing are first in line at CupoNation Poland – all five are Rocket Internet portfolio companies. Driving traffic to other Rocket Internet companies might be the main motivation for starting up CupoNation (as it might have been for the Samwers’ Pinterest clone Pinspire). Just as likely, it’s a bid to get back into the discount business – following the Samwers’ success with Groupon clone CityDeal, sold to Groupon in 2010, and recent problems in the daily deal industry. Coupons instead of daily deals might prove a winning ticket.